A sparklingly, fresh salad to complement and cut the rich oiliness of the stuffed mackerel fillets. Just one large fennel bulb (outer leaves removed), one large spring onion (outer layer removed), one long celery stick (sliced thinly), several large red radishes (sliced thinly) and some chopped parsley to sprinkle over. Add some lightly pan roasted sunflower seeds–if you have them and a dressing of the juice of a lemon, some salt and pepper to taste and three or four tablespoons of the best olive oil you have, whisked in. Turn everything over carefully so the dressing gets to visit all corners! This looks so tempting but I am not a fennel fan. Do you think this would work with raw cabbage or even lettuce? The mackeral looks really good too. Is the recipe in one of your books? 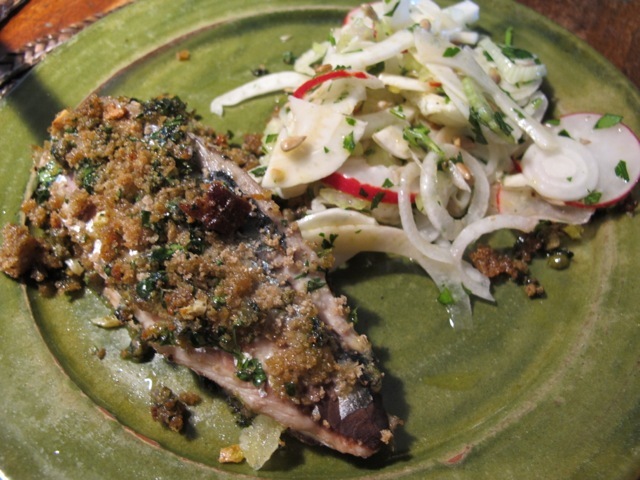 The mackerel recipe is in my first book–Delicious Dishes for Diabetics. It is a favorite. 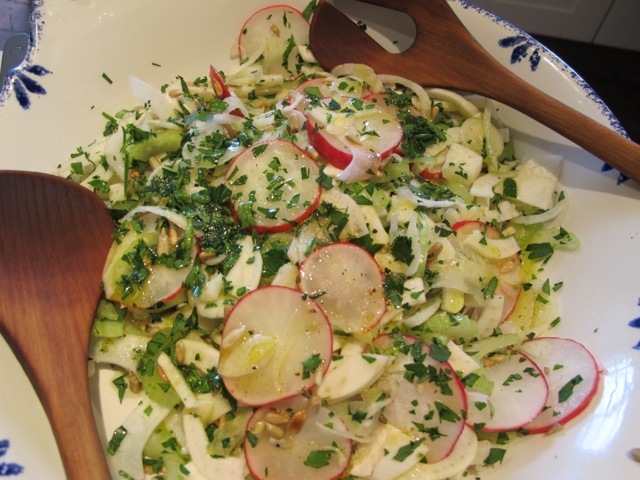 cabbage instead of sweet fennel–I’m not sure, give it a go though and tell me how it was. Radish, spring onion and celery with some apple sliced in? so you get the sweetness. Add some dry roasted walnuts/hazelnuts too? Dear Robin Thank you for sending your delightful recipes which help me in my fight with a chronic illness that causes me physical pain 24/7. After my appetite going down to Zilch! and no longer inclined to cook my usual 3 course dinners which gave me great pleasure as I love looking at, buying, handling & chopping & cooking food, as well as eating it, your dishes are proving an inspiration & a delight to eat. Thank you for the pleasure you still give when I re watch you in the Poldark DVD’s. I am glad to see that you have turned to writing & in doing so, found a new life for yourself through cooking & helping people like me. Have a great year. Hi Diane–it is heartening to hear that the recipes are some help to you and are persuading you go on chopping and cooking!–thank you. I have just discovered how crisp and fresh sweet fennel is after enjoying it with the artichoke dip Robin has recently featured. This is a deliciously fresh salad and wonderful to serve on a warm spring afternoon. Funny that I never knew of fennel before. My guess is that since it wasn’t something on the menu my mother served us as children, I never really thought to use it. So, thank you again, Robin, for introducing me to something new and oh so delicious~!